1 Cover potatoes and Bouillon Cube with water in 4-quart saucepot. Bring to a boil over high heat. Reduce heat and cook uncovered 10 minutes or until potatoes are tender. Drain; DO NOT RINSE. Let cool slightly. 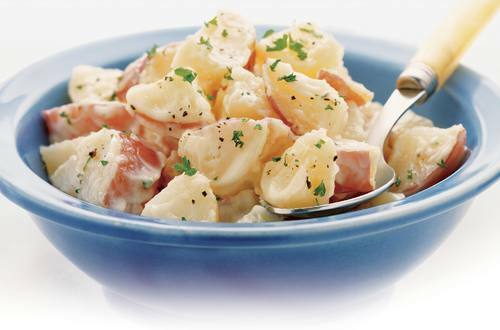 2 Combine cooled potatoes with Hellmann's® or Best Foods® Real Mayonnaise in large bowl. Serve chilled or at room temperature. Garnish, if desired, with parsley and black pepper. Too Easy? Then add your favorite potato salad ingredients such as onion, celery, hard-cooked eggs, relish or mustard.